London, England, AD 1745 . Now set as the lid of a 19th-century tortoiseshell box. The recognition and development of the art of chasing in England in the eighteenth century owed much to the skill and influence of Swiss, German and French immigrants. The most accomplished of these was George Michel Moser (1706-1783), one of only two chasers described and praised by George Vertue (1684-1756). The note-books of Vertue, a writer, antiquary and an engraver of considerable repute, are the major source of information on artistic life in England in the first half of the eighteenth century. Ishmail Parbury (died 1746) was the second chaser praised by Vertue, who describes this particular plaque as a ‘masterpiece’. Parbury is still regarded today as one of the finest chasers of the time. 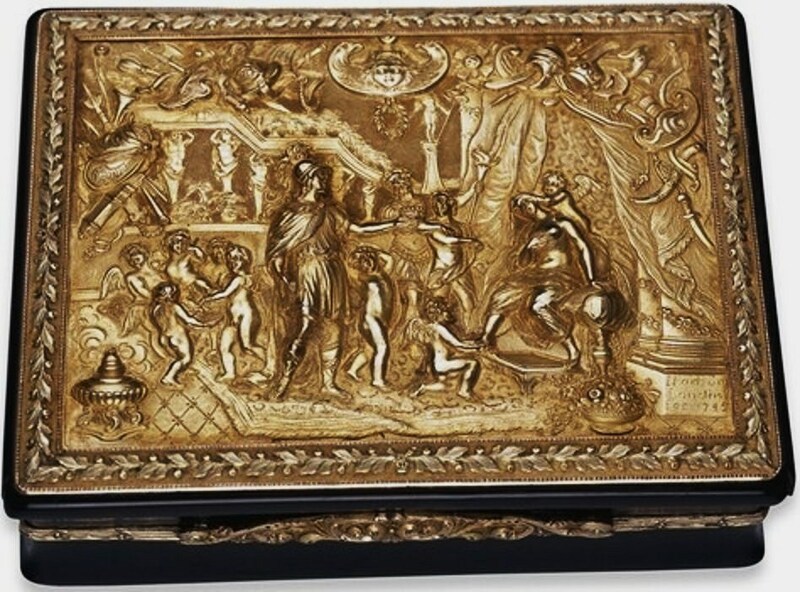 It is rare to find contemporary references to chasing (the working of metal in relief from the front), and even more remarkable that the two pieces referred to by Vertue survive today: this plaque, and a gold box by Moser in the Metropolitan Museum of Art, New York. The scene on this plaque depicts the marriage of Alexander the Great and Roxanna, the daughter of a defeated King. It is based on a tapestry cartoon of 1684-6 by Antoine Coypel (1661-1722): Parbury was probably working from a print. In 336 BC Alexander the Great embarked on a programme of territorial expansion, which would eventually extend the boundaries of the Greek world to Egypt in the south and to India in the East. In 334 BC Alexander crossed the Hellespont, the narrow strait separating Europe and Asia, and went first to Troy. There he dedicated his armour to Athena and laid a wreath at the tomb of Achilles, the legendary hero and champion of the Greeks in the Trojan War. This act prefigured Alexander’s role as a new Achilles liberating the Greek cities of Asia Minor from Asiatic rule. That same summer of 334 BC, a successful engagement with the Persian army at the river Granicus, east of Troy, opened the gates of Asia Minor, and Alexander proceeded to tour the Greek cities of the west coast, expelling their Persian garrisons. On reaching Priene, he made a further dedication to Athena. There the townspeople were laying out their new city and building a temple to its patron goddess. 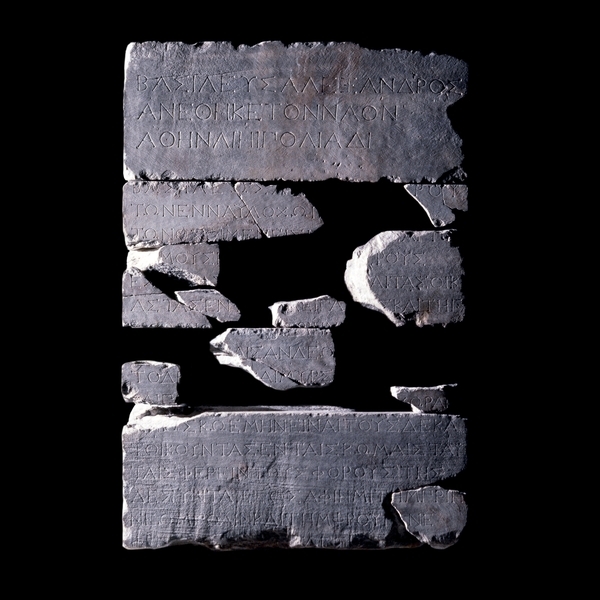 Alexander offered funds to complete the temple, and the inscription on this wall block, cut into a block of marble, records his gift. The inscription was found in the nineteenth century by the architect-archaeologist Richard Pullan leading an expedition on behalf of the Society of Dilettanti. It reads: ‘King Alexander dedicated the Temple to Athena Polias’. Throughout antiquity royal dynasts promoted an image of themselves as fearless and heroic huntsmen, courageously battling with wild animals while accompanied by members of their court. Such scenes appeared on tombs or victory monuments, and were particularly common during the fourth and subsequent centuries BC. The royal hunt had been a frequent subject of Assyrian and Babylonian art, and often appeared on monuments in Egypt. The hunting theme spread westwards across the eastern Mediterranean and became popular in the Greek speaking world. It is possible that it became part of the standard repertoire of subjects on royal monuments, whether the subject actually fought wild animals or not. 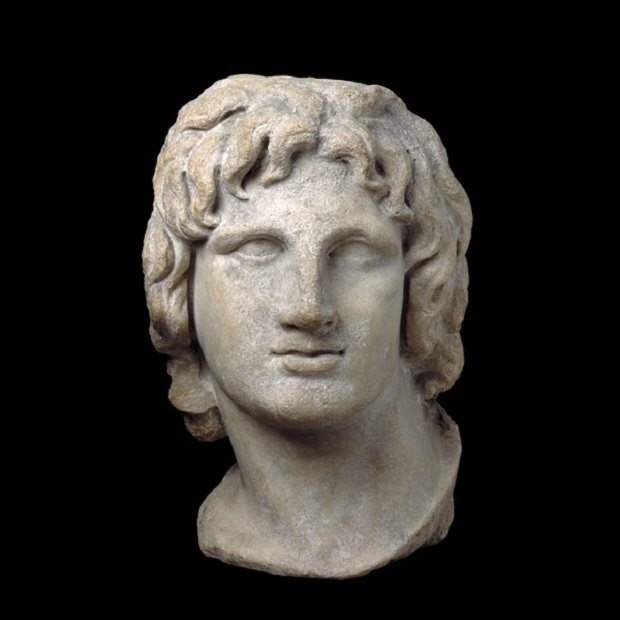 Alexander the Great had himself immortalised in sculptural groups participating in hunts. 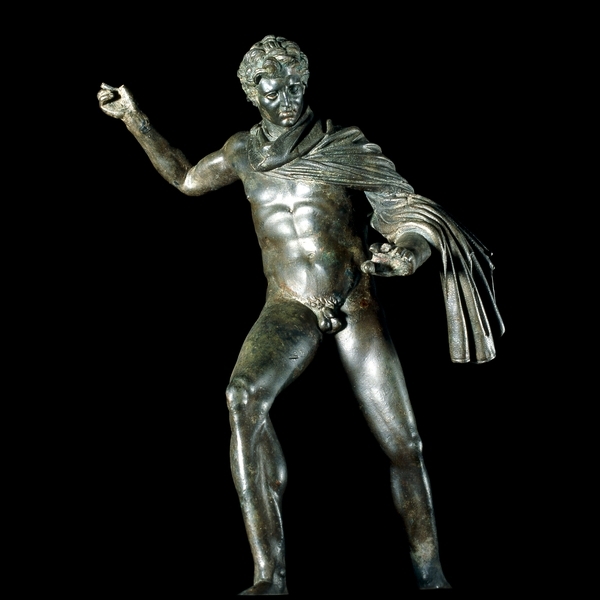 This bronze figure of a man thrusting a spear into a wild animal has facial features not unlike those of Alexander. The statuette may come from a small-scale composition inspired by a larger group of bronzes at Delphi. These statues were dedicated to Alexander by Krateros and were reputedly made by Lysippos and Leochares, two of Alexander’s court sculptors. 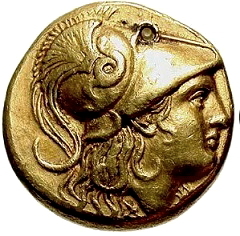 If it does not represent Alexander himself, it may be a portrait of one of his Macedonian successors.